Brazilian metal label Imperative Music is fond of releasing compilations, the eighth of which I have listened to . Its subtitle "The Awesome Ones Of The Independent Music" sounds grammatically a little awkward but makes it clear what to expect. This is not for profit, but rather to make promotion for all kinds of underground metal. The fact that the compilation is distributed for free is of course nice, but in times of Bandcamp, Spotify and the likes, one wonders if this is still appropriate. There are always a couple more popular bands on the compilation, as an incentive for people to listen to the CD. This time Relapse Records offer a track by Obituary, and Nuclear Blast one from Epica, both bands delivering of course in their respective death metal and symphonic metal genres. Elephant from Brazil play groovy hard rock à la King’s X. Killrazer from Australia convince with progressive thrash metal. Music from Uruguay isn’t so commonplace in Europe, but Fallen From Skies show that they are quite adept with their rhythmic groove metal. Another exotic metal country is Macedonia, where Agni Kai are from. They remind a little of Faith No More but sound even crazier. You won’t find any Metallica on this compilation, but Belgian band Guilty As Charged sound very close to the late works of the Bay Area kings. Fragmenta from Australia show that the fifth continent not only has hard rock, but also excellent thrash metal bands. The first eight tracks were all very good or excellent, but this was unfortunately followed by a sobering up experience. The second half was a definite drop in quality. Numbness from Brazil and Winterhearth from Canada come with a badly produced that sounds like early Venom demos. Spit from Brazil play a nice mix of death and thrash metal, but they are followed by the Swiss band Meltdown whose bumpy thrash metal fails to convince. Seconds To End from the state of New Mexico in the USA play symphonic black metal with a lot of electronic gadgetry that knows how to entertain. And this was already the last highlight on the CD. Brazilian Marenna play slick melodic metal. Kingdom Stone, also from Brazil, play a dull rock song that sounds like a Saxon ballad. The end comes with Harry Loisos (Netherlands) and Shepherd (Taiwan), two guitar heroes who are definitely skilful players but perform a genre that’s lost its allure probably twenty years ago. As this compilation is offered purely for promotion, you can’t do anything wrong by getting it. You get a CD filled to the last minute with metal, even though the second half is at times quite tedious to listen to. 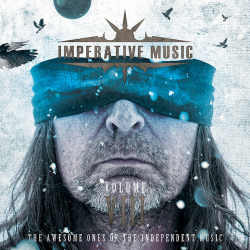 The label’s efforts in promoting underground bands deserves recognition though, and therefore one should look forward to future compilations by Imperative Music. One wonders if the label wouldn’t reach a wider audience if they offered also a digital download.